Texas Governor Greg Abbott ordered the State Preservation Board to remove a Freedom From Religion Foundation Bill of Rights and Winter Solstice display from the Texas Capitol today. A letter from Abbott dated today urged the Executive Director of the State Preservation Board to "remove this display from the Capitol immediately." It is FFRF's information and understanding that the display was actually removed yesterday. "Ironically, the very document that our display was honoring is what protects this form of expression," said FFRF Co-President Annie Laurie Gaylor. "Government officials cannot censor our speech because they disagree with our secular message," added Gaylor. FFRF received a permit for the display, which was placed in the ground floor rotunda on December 18. FFRF placed the display on behalf of its nearly 1,000 members in Texas. The Bill of Rights "nativity" and accompanying sign were removed yesterday. FFRF duly met the requirement of having an educational purpose (unlike the nativity scene) and a legislative sponsor, State Rep. Donna Howard. Howard has already condemned the governor's action. Abbott complains that FFRF's Bill of Rights display is "tasteless sarcasm" and that FFRF mocks "our Nation's Judeo-Christian heritage." Ironically, Abbott cited a fake George Washington quote, while claiming the FFRF display "promotes ignorance and falsehood." The U.S. Supreme Court has held that viewpoint discrimination in a public forum violates the First Amendment. "We are disappointed that Governor Abbott has let his personal opinion of FFRF and freethought be a catalyst for the censorship of our display in the Texas Capitol," noted FFRF Staff Attorney Sam Grover. "Removing our Bill of Rights 'nativity' while allowing a Christian nativity to be displayed in the Capitol is discriminatory and illegal. Abbott is sending the message that nonbelievers are second-class citizens in Texas. He should be ashamed." FFRF has encountered — and triumphed — over gubernatorial censorship in the past. Then-Wisconsin Gov. Tommy Thompson ordered a banner, reading "State/Church: Keep Them Separate," ripped down from the Wisconsin Capitol rotunda in the late 1980s. FFRF sued. The case was resolved after the state promulgated a viewpoint-neutral policy. 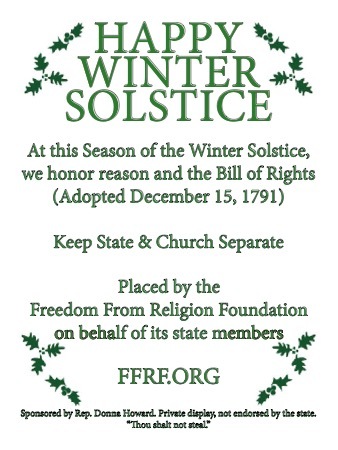 FFRF has placed a Winter Solstice sign in the Wisconsin Capitol in December unmolested for 20 years, and this year, in response to the relatively new presence of a crèche, erected the same Bill of Rights "nativity" without any interference by Gov. Scott Walker. Gaylor said FFRF will be pursuing legal redress. "It's Abbott's action that is immoral — and unconstitutional, not our display honoring the Bill of Rights." FFRF, a national state/church watchdog, represents the views of 23,000 nonreligous members nationwide.